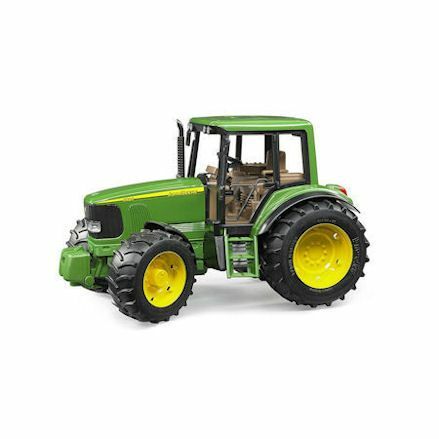 Currently available from the Bruder John Deere tractor range, stands these three models in 1:16 scale. Well very similar, they are different in the size, weight and detail. This should assist you in making an informed decision - so you don't forget to take crucial detail in to account. Where we go into detail here, we could be talking about any major tractor manufacturer name in the Bruder series, but we think John Deere need a guide of there own. Well we lay it all out for you what they have to offer and the top features, bare in mind Bruder offer many John Deere farm vehicles, so would all match up quite nicely. In the Bruder agriculture series, there's something you'll instantly realise if all models were viewed side by side. And that is its mostly made up of green and yellow, and those are the colours of John Deere with green bodies and a striking yellow alloy. What this means is when it comes to selecting a trailer or farm implement to go with a Bruder John Deere tractor, you're not short of options. And this is what we advise you to do, there's nothing more attractive than a John Deere tractor trailer matching up. There's simple tipping trailers for hauling goods, to more complex implements including a number of Bruder toy balers. This is all supported with additional John Deere combines to gators. You may also think about towing Britains Big Farm trailers in 1:16 scale also, as they should be compatible. Like all Bruder tractors the options to buy one with a front loader is available. If you're afraid to buy a tractor without a loader and interested in buying one with a loader already attached, think again. All front loaders that come with Bruder tractors have the loader detached and packaged away for transport to prevent damage. This leaves you to attach the front loader yourself regardless. And don't worry, its very simple to attach a front loader to a Bruder tractor. Keep the connections inline as you clip them to the corresponding attachment located behind the front wheels, down by the side of the engine. If you don't want or need a front loader right now, not to worry as you can upgrade later any time, as they're sold separately with various attachment designs for all needs. There's more to the wheels on all three Bruder John Deere tractors than you think. Well they're there to do there job with deep treads for sinking into mud and towing heavy implements, there's more functionality than meets the eye. How much we depend on the mechanism of the wheels turns to the front loader also; as you attach the front loaders using the bar tucked away behind the front wheels. So well not directly in contact, but near the wheels all the same. Let's explained in more detail how dependent the Bruder tractors are on the wheels and how useful they are. 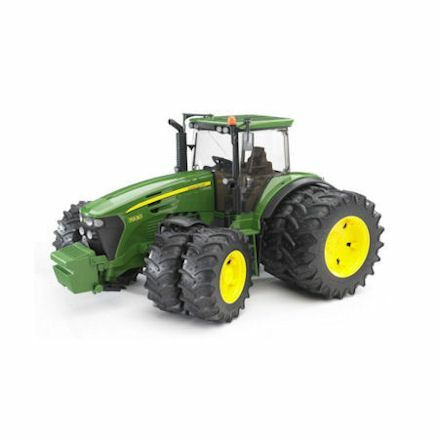 As with all Bruder tractors, these John Deere tractors offers real active steer. By that we mean they can be steered manually by hand, but what if you could steer the wheels using the steering wheel located in the driver's cabin. Well you can drive all tractors using the driving rod, this long plastic rod reaches through the slide open window on the cab roof. Once passed through, push down on the centre of the steering wheel until you hear a click, then the rod is secured and you're ready to steer the tractor via the steering wheel. Well the rod is attached, you can still use a Bruder tractor driver behind the wheel. That's right anytime you need more tread to sink into the ground for better grip, Bruder are there supplying a matching set of wheels. This extra set of four wheels (in case of John Deere with yellow alloys) clip onto the outside of the original pair of four wheels to bring that to a total of eight wheels. Once attached, they can stay put as they won't obstruct any functionality of the tractor. Steering is still possible, the cabin door can be opened and the front counter weight can be attached, it also doesn't prevent movement when towing trailers on the hitch. The idea of a powerful suspension on Bruder tractors is so that all wheels are firmly on the ground at one time. During field work like plowing, cultivating and driving over rough country side, the wheels could come off the ground and therefore you'll get stuck without suspension. Bruder's tractor suspension is so powerful in fact you can dive over big rocks and stones without any wheel coming off the ground. In a nutshell, all Bruder John Deere tractors work the same, with or without dual wheels, a front loader or trailers, they all boil down to the same functionality. Despite being release at various times over the last decade or more, if you owned the earliest release and the latest, it will be hard to tell them apart. We can tell them apart a little bit, for example the first release model has no windows, well later additions all have windows. Then there's a weight difference, obviously the bigger models are heavier. 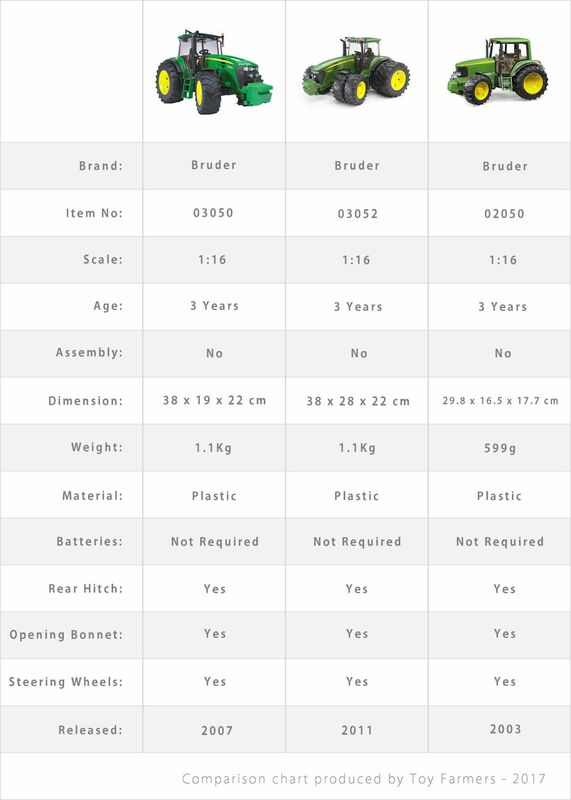 But let us spell what that all means using our comparison chart, instead of boring you with words, take a glance at our comparison table below. Now that we hope we've explained any unresolved issues away by laying out all the features the Bruder John Deere tractor series has to offer you, its time to consider one. 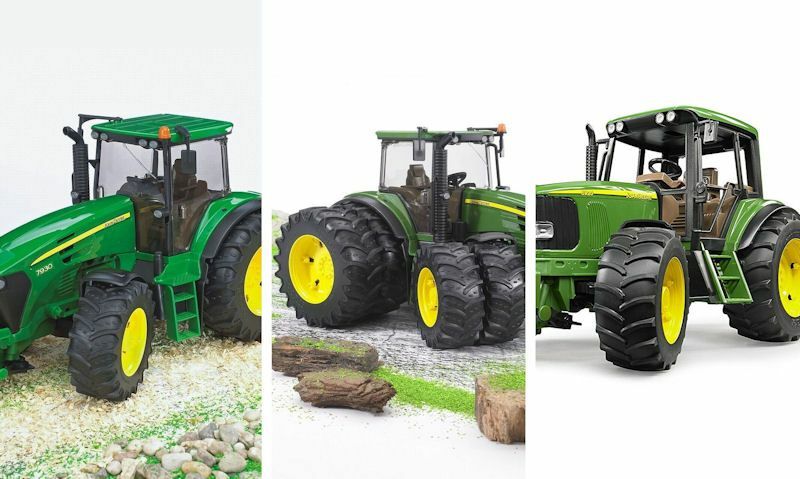 And these are all three JD tractors available to you from Bruder in 1:16 scale. But remember, all models pretty much offer you the same features and functionality, with weight, size and the driver's cabin with or without windows and opening doors. Start off with a standalone Bruder tractor or consider one with add-ons like a front loader or a set of matching dual wheels or a trailer - when or if available any time. One of Bruder's oldest models, this John Deere tractor is still going strong over a decade later. Setting the standard, it features opening bonnet and doors, suspension and a steering rod for driving the tractor through the cabin roof. As a standalone model it comes at a good price, with that said there's an option to use dual wheels, attach a front loader or tow a matching John Deere tractor. All these add-on's can be bought with the tractor but ideally you could bring them in later as the child's needs grow for more functionality and play value. When this tractor was released, Bruder had no such thing as tractor driver's, and now they do they will fit nicely into this John Deere. If you're thinking this one looks familiar, you're not wrong. 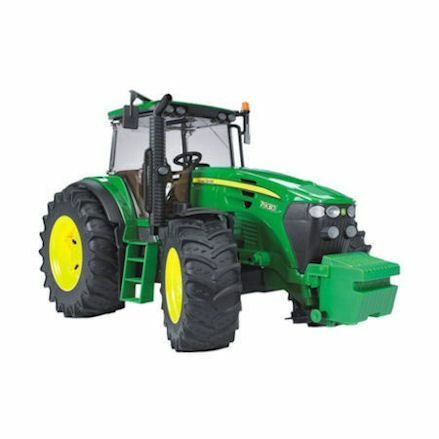 This John Deere tractor is the exact model featured above, with the bonus twin tyres for your heavy farming needs. And well it's equipped with the detail explained above, you can remove these tyres if needed, but the kids will probably keep them on longer than off. To begin with, in theory it should save you a little money than being bought separately, and then there's a added play value where a standalone model might need extras. Well still a big model in itself, but compared to the models above it does come in a little smaller, and probably ideal if the Bruder tractor size is a problem. But with all Bruder tractors, expect to find an opening bonnet with a detailed engine, but this one doesn't have windows or opening doors. As one of the first releases many years ago, it wasn't in Bruder's plans to put in windows as they felt this would obstruct play inside the driver's cabin. Without windows you could also say the thin panel of clear plastic is likely to break. But this is not so anymore, all future Bruder releases have panels of plastic windows, with access gained through opening doors. A feature we're afraid, is not available in this model.